People-pleasing is about putting more value on others than you do yourself. You do not make a conscious decision to do so. It’s unconscious conditioning. It starts as little girls when we are told to be quiet and think about others people first. You are told things like being selfish is wrong, to put others first. You are taught to place other people’s needs and wants above your own. Then you became a mom! Your little ones require all your attention. You love them, so you gladly give it. They grow and don’t need it as much, but you still provide it with the thought that they deserve to have it easy. You can do it, so you do. They enter school, and you want to be with them, so you volunteer. They join a sports team, so you volunteer for that. You volunteer and over commit to being useful / around them / involved whatever you tell yourself to justify it. Before you know it, ten, fifteen, maybe twenty years have passed of you doing too much! The crisis moment has arrived. You are not sure who you are. You have only been giving to OTHERS because that is what you were taught to do. Now you have to decide YOU are worth your attention. No matter the age of your kids, you need to put yourself on your calendar. Somewhere the message you accepted was you had to give everything of yourselves to be worthy. Over giving of yourself does not make you worthy! You are worthy because you ARE! 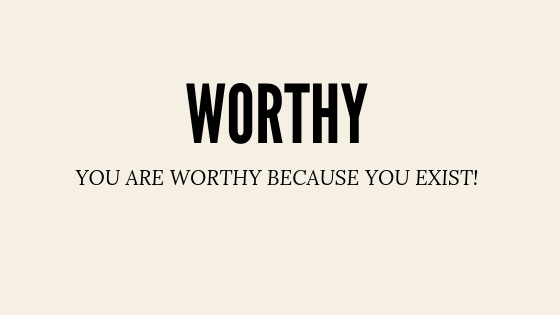 You exist therefore you are worthy. And repeat!! That is the core belief that has to get adjusted to stop people-pleasing. You are not worthy because you give. You have to start remembering you are worthy. Period!! You deserve happiness, health, and wealth because of who you are!! Not what you do! So much about people pleasing and over giving is an attempt to EARN the respect of others. You get caught in the cycle that you have to do something to get what you most want – love and affection. They need me to do it. I will make myself too crucial for them to leave me. What you are doing is attempting to feel worthy. You can’t control what others do or how they treat you. You can set boundaries that ensure you surround yourself with people that make you feel worthy to yourself. You have to know you are worthy then allow them into your life as they value your worthiness. Knowing you are worthy is the beginning of understanding what makes you happy. Carving time for yourself is not selfish. It’s the most loving thing you can do for your loved ones. The burden of making someone else happy is heavy. In truth, it’s an impossible burden. Mom’s carry the burden to maker her children happy. Yet, when you are not satisfied your children carry the burden of attempting to make you happy also. They know you aren’t happy and wish you were. Knowing your worth and that you can BE happy starts with you. It is the key to recovery from over-giving. 1 – Tell yourself a million times a day that you are!! As silly as this sounds it all starts with self-talk. The things we tell ourselves are the foundation of what we accept from others. Pay attention to your thoughts, your criticism, your acknowledgments of your successes. Speak to yourself like you are your best friend!! Again this is about creating reminders for yourself. Write down your good qualities. Remind yourself. These are not about what you are good at for OTHERS. Make these about what YOU. I have an incredible heart. I can accomplish any goal I set. Ya, we hide from our self. We stay busy, so we don’t have to feel our emotions. Part of knowing you are worthy of your desires is knowing what you are feeling. If you don’t like it, figure out why. If you want it, do more of it!! Many times we know the feelings of our family much more than we know our feelings. We have numbed ourselves because we figure we are supposed to feel a certain way. We should feel good because our kid is happy. But their happiness could come at the expense of our feelings. An example is they want a new car, and you agree, but you know it will cause more financial stress for you. You give in to buying the car you can’t afford so your son is happy. Thinking his excitement will be enough to make the stress worth it. See how their happiness doesn’t make you happy?? Feel your emotions!